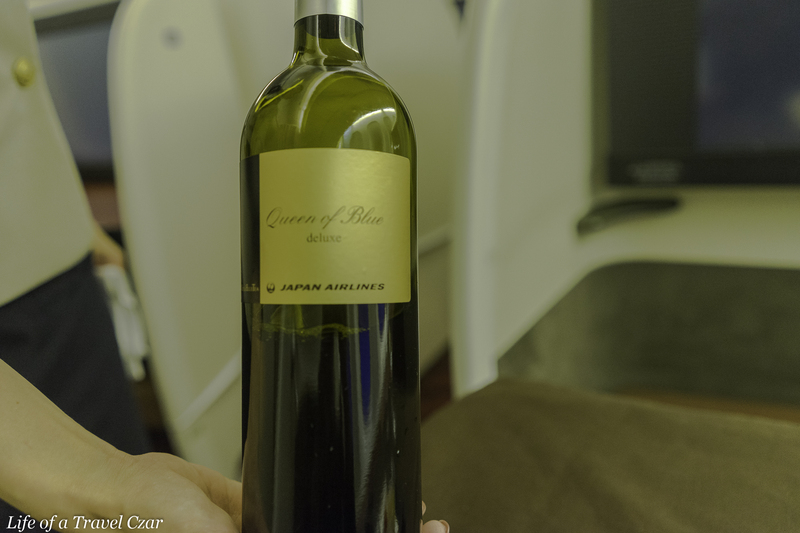 I check into my JAL flight from London to Tokyo as I finish my whirlwind adventure around Europe. 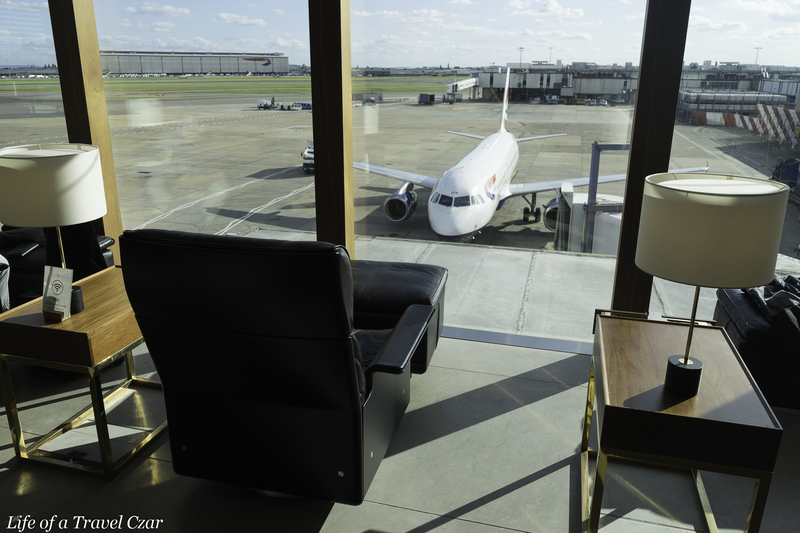 The flight unfortunately departs from Terminal 3 which struggled with quality lounges since BA moved most of its operations to Terminal 5. I was previously left a choice of the depleted BA Lounge or the AA Lounge. 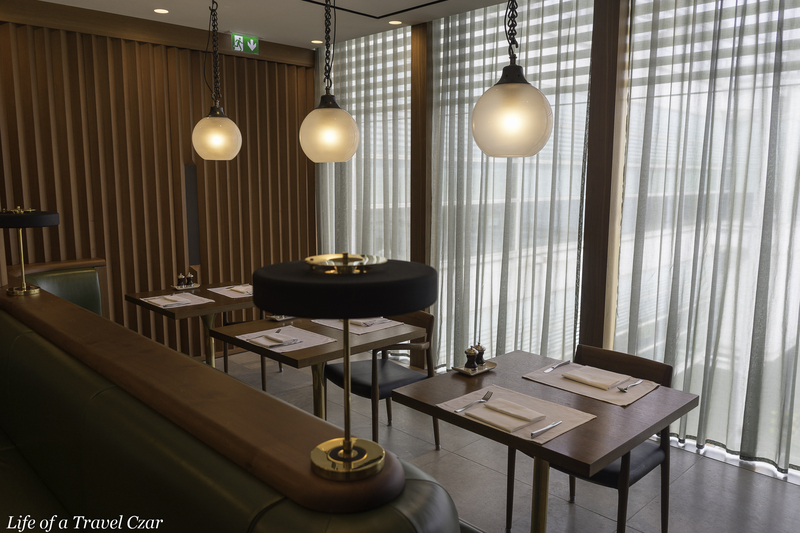 However today I check-out Cathay Pacific’s new First Class Lounge which opened recently. It proves a much better alternative than any other lounge in Terminal 3. There is a beautifully appointed private dining room with a la carte menu. 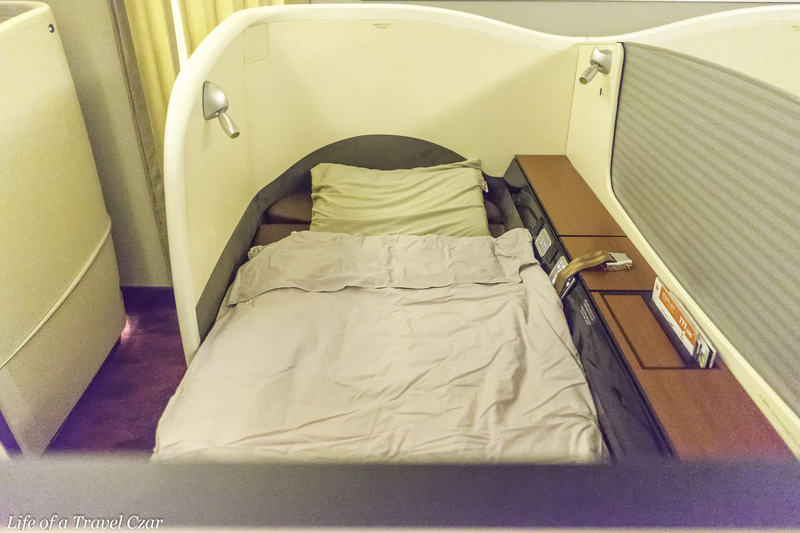 It has the same design and feel as The Pier First Class Lounge in Hong Kong. 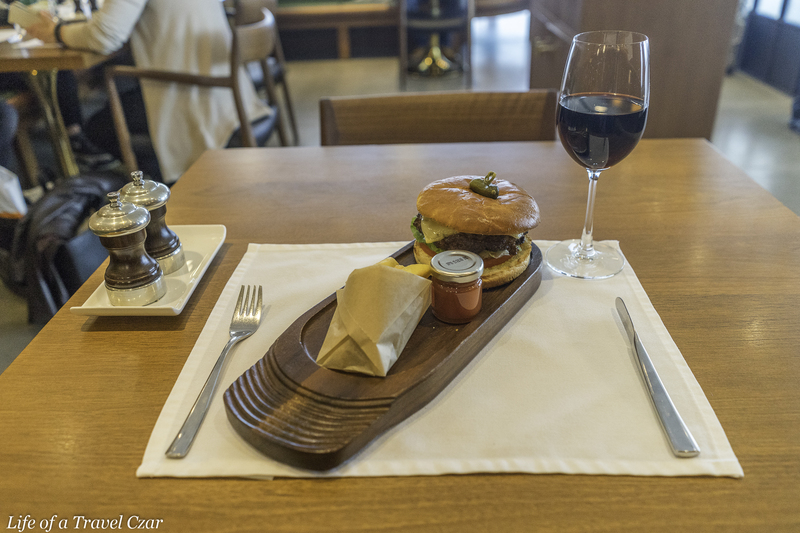 I have the burger with a beautiful glass of Bordeaux wine and I must say it is one fine burger. Today I opt for a light lunch before boarding. 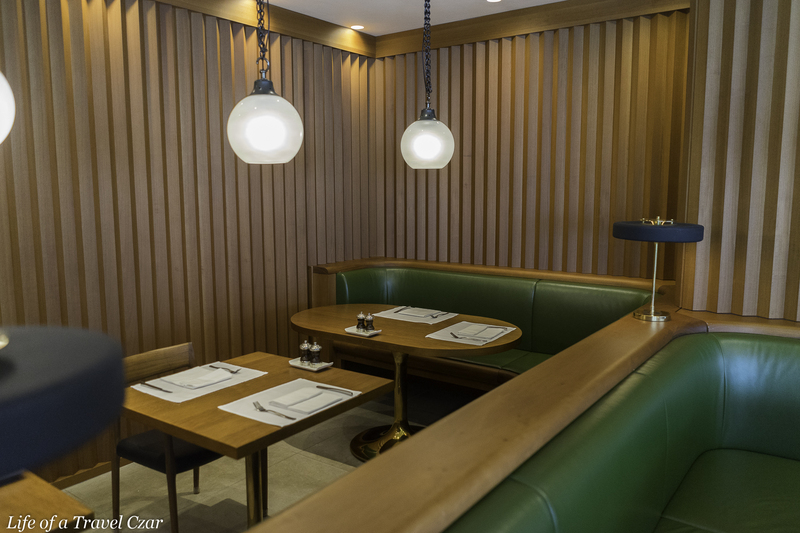 The fine service in the lounge and its ambiance prove to be thoroughly enjoyable. I decide to leave the lounge a little early and head for the gate as I’m keen to board the flight. 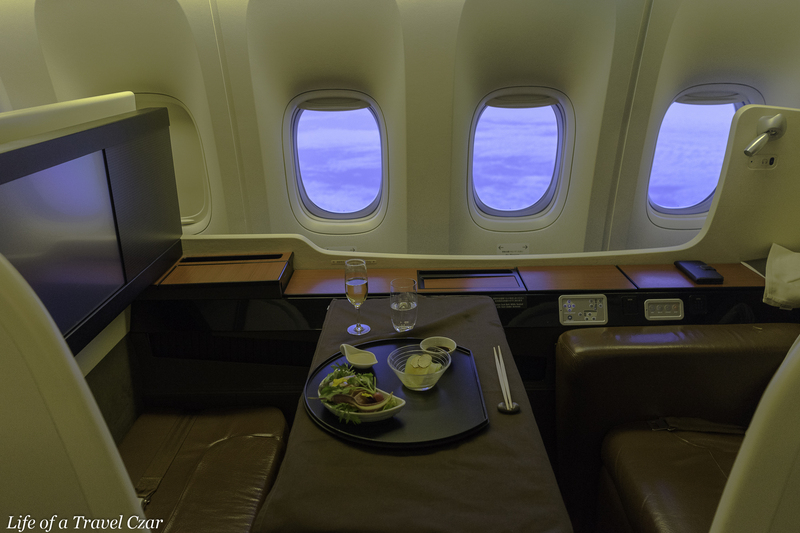 I eventually am onboard and am taken to the Suite. 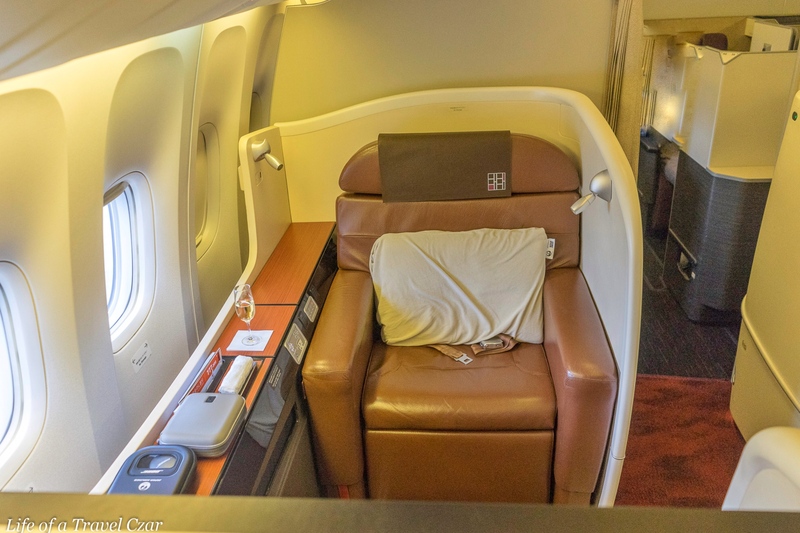 Japan Airlines’ has only 8 seats in the First Class cabin which makes them considerably more private than most other major airlines. 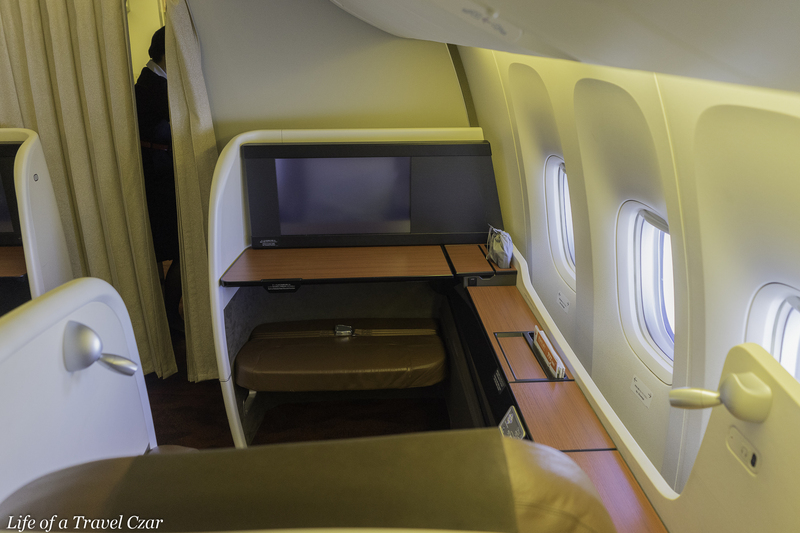 The JAL Suites are not fully enclosed but they are probably the most private of the open First Class products. The carpet is a beautiful dark red to project a sense of luxe. The shell casing of the Suite is a light cream colour. The seat and ottoman is made from soft brown leather and is quite comfortable and spacious. The side of the Suite closest to the window has lovely woodgrain finishes. 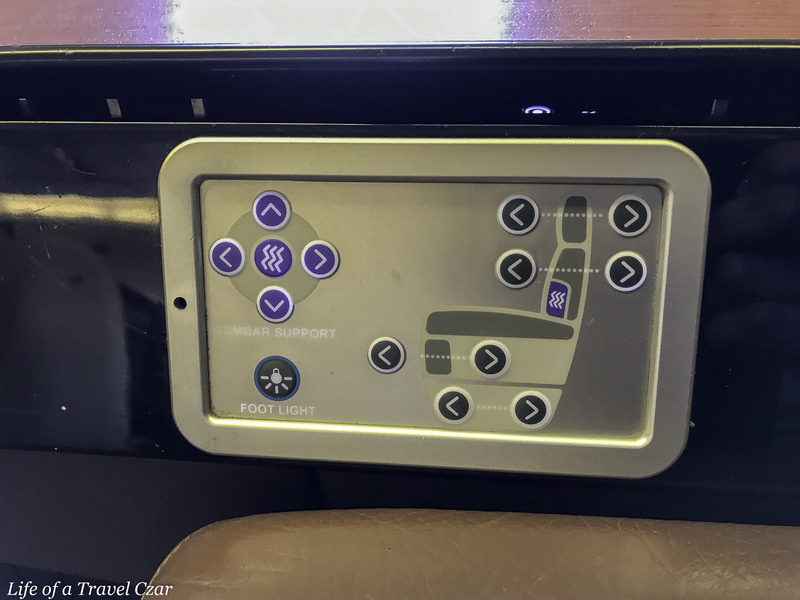 The seat converts into a fully flat bed and has a pretty useful massage functionality. 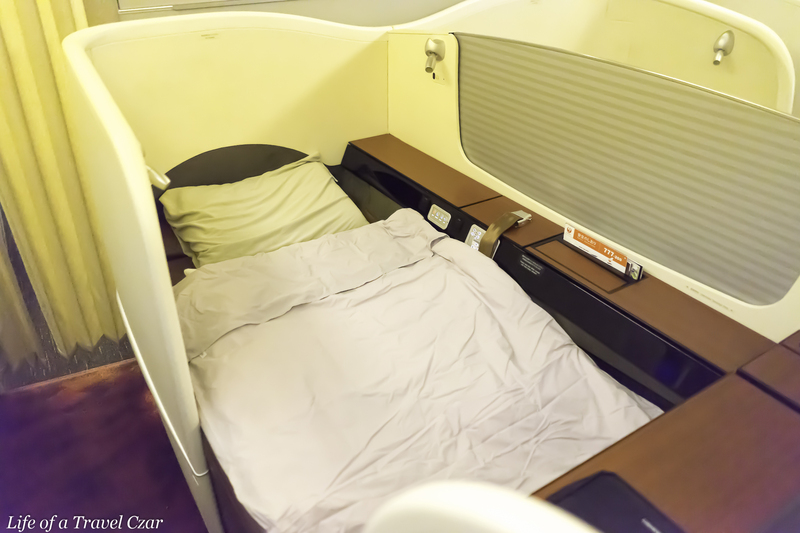 There is plenty of storage space; with compartments in the side of the Suite, spacious overhead lockers and underneath the ottoman opposite the seat. 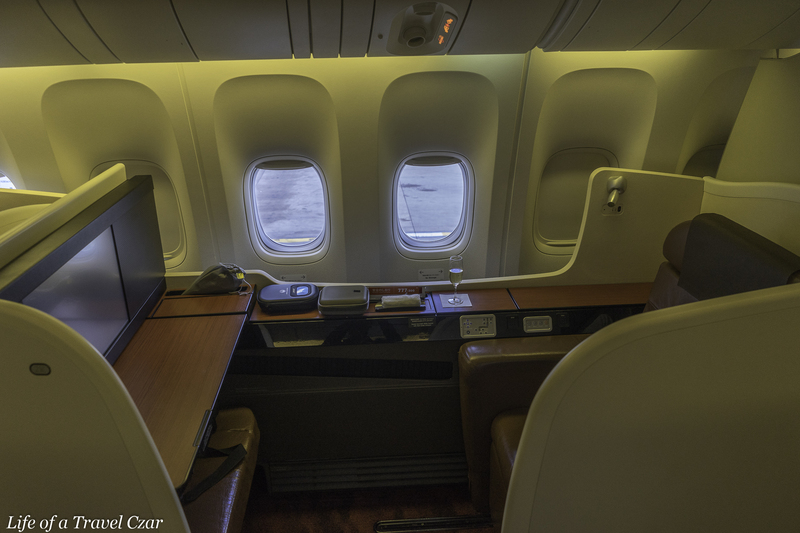 Here is a little video tour of the cabin and Suite prior to take-off. 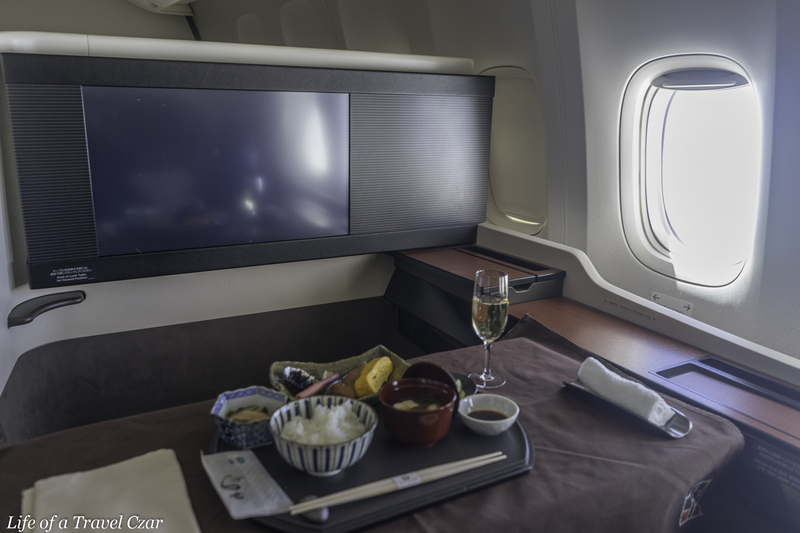 There is a beautiful 23 inch TV (pictured above) and some Bose Noise Cancelling headphones to help you enjoy the inflight entertainment. 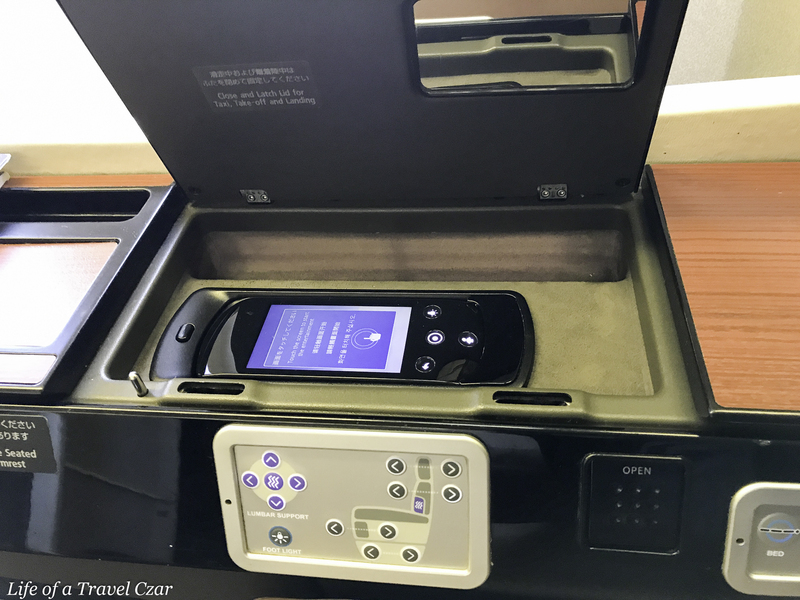 The inflight entertainment control (below) has a small viewfinder to easily navigate the range of entertainment options. Standard overhead reading lights are built into the side of the Suite. 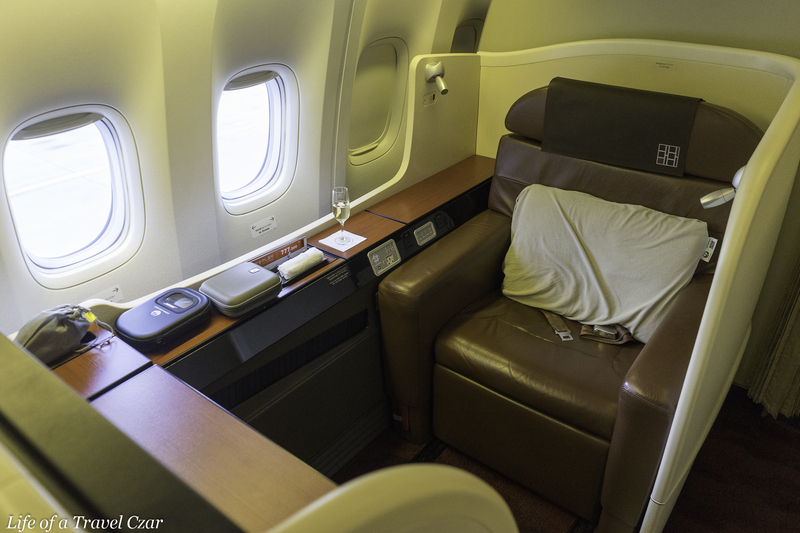 JAL also provided a voucher to use the Wi-Fi which was useful to stay connected with happenings on the ground. I waited for this moment for my whole trip. The opportunity to taste what is the grandest of grand cru – the perfect chardonnay. It’s with a sense of allure, deep desire, sensuous anticipation and nervous joy that I approach the glass. Time stands still for that moment with the light yellow liquid gazing back at me as the bubbles escape the Riedel glass. The aromas are fresh with lovely limestone notes, flowers and toasted brioche. There a sense of indescribable purity of limestone on the nose. On the tongue the burst of every individual bubble delivers a soft tart fruit flavour confection. Its a mix of light citrus, candied tropical fruit with arrows of white pepper and nuttiness intertwined in beautiful fresh minerality. It’s crisp but flows effortlessly, its embraces but evades, kisses then leaves. There is a balance so finely tuned – it really is the art of perfection. Eventually dinner is served. 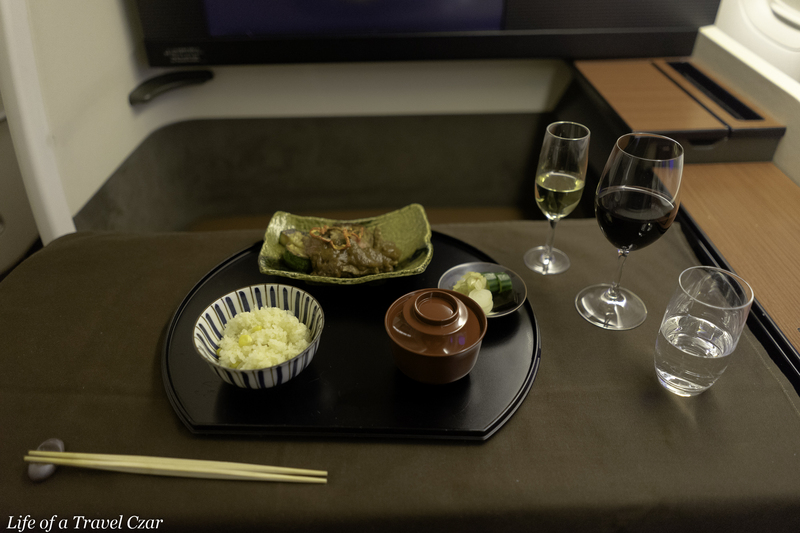 There is a choice between a Japanese menu (a tasting course of Japanese inspired cuisine) or a Western Menu (a standard entree, main course and dessert). I opt for the Japanese Menu. The boiled summer vegetables are refreshing but simple, the vegetable, eel and egg threads are simple with the smoky richness of the eel on display while the salmon is rich with a light set of accompaniments. The Salon continues its journey providing a fine dance partner as the plane continues to glide at altitude. 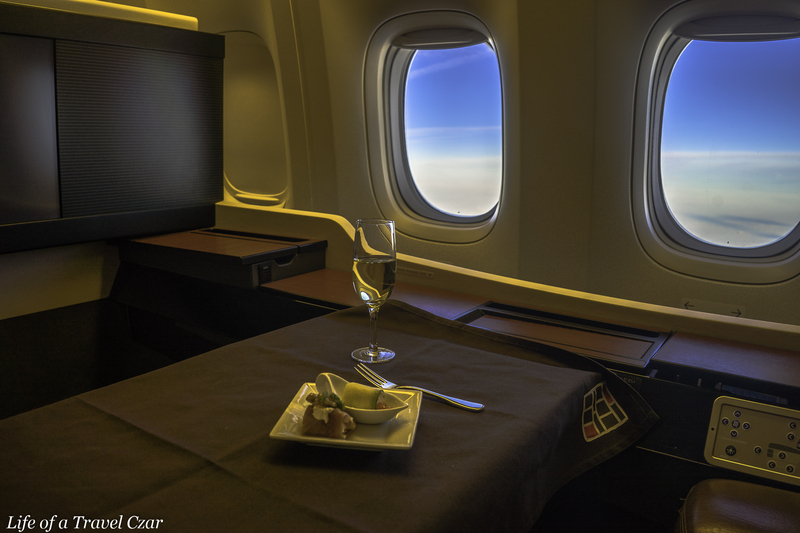 The view from the seat at the clouds, the skies, the champagne and amazing culinary showcase is just amazing. The other dishes in the first course are more stunning in flair and flavour than the ones above. The octopus (imbued with the tart rich vinegar) showcases its distinct flavour harmoniously interacting with the seasoning. It goes wonderfully well with the Salon too. The quail is a beautiful trapeze of salt from the quail’s skin and the sweetness of the soy. Its gamey flavour is strong to battle any seasoning and the carrots and walnut mix add a nice textural contrast to the dish. The experience is amazing and difficult to capture in one photo so here is a small clip of the first course of the Japanese Menu and the gaze at the clouds. The background tune is “Underflow” by Emma Louise. I do not own any rights to the song. The strength of the ginger which has a little bite, the rich juicy chicken meatball and the crunch of the fired leeks. Its a simple dish executed rather nicely. The leafy salad is quite a delight. There is the inherent salinity of the kelp and the refreshing fresh flavours of the bream and tuna. The foie gras was not as noticeable as it should have been and the wasabi did pack too much of a punch but it was still a well weaved dish. The scallop and apple dish is nice. The rich salinity of the scallop and the tart sweet apple was a nice combination. Although I do tend to enjoy my scallops rather plain (with some exceptions) for the full expression of flavour. It is time to switch wines as the main course (beef) arrives. I do stick with a glass of Salon on the side but I move to a full bodied Bordeaux red. 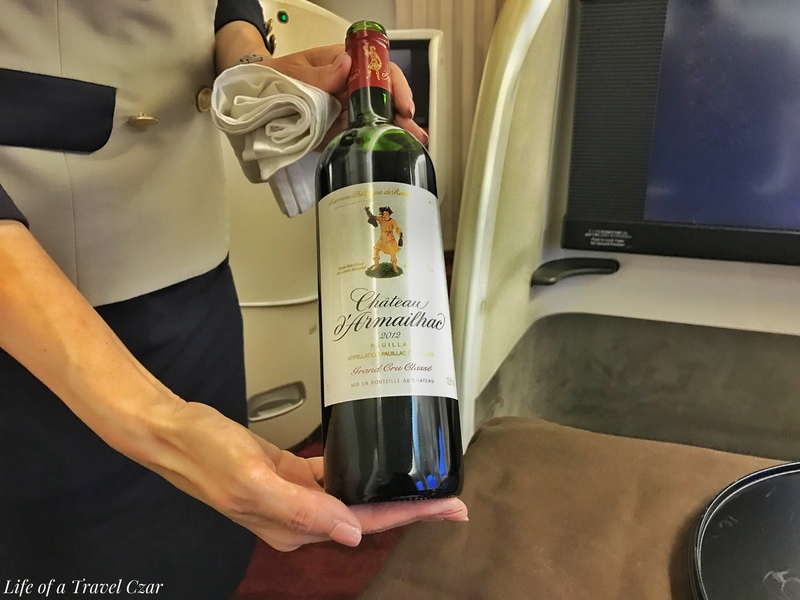 This is quite a pick in terms of wines, it is owned by Chateau Mouton Rothschild and they have brought many of their techniques in producing the First Growth to this vineyard. It is a Grand Cru Classe, but on a relative scale is not at the end where Salon is for Champagne. The wine is primarily Cabernet Sauvignon (54%) and Merlot (29%) with some Cabernet Franc and Petit Verdot. On the nose the distinctive red fruits of a Cabernet are present with some cassis, some decent oak and hints of mocha and spice. It is a very expressive nose I must say. On the palate the beautiful Cabernet body comes through with good red fruits flavours and a little oak bite early on in the taste. This is combined with some more deeper notes of liquorice, mint, walnut and some lovely silky tannins to perfect to taste experience. The wagyu beef is a delightful. 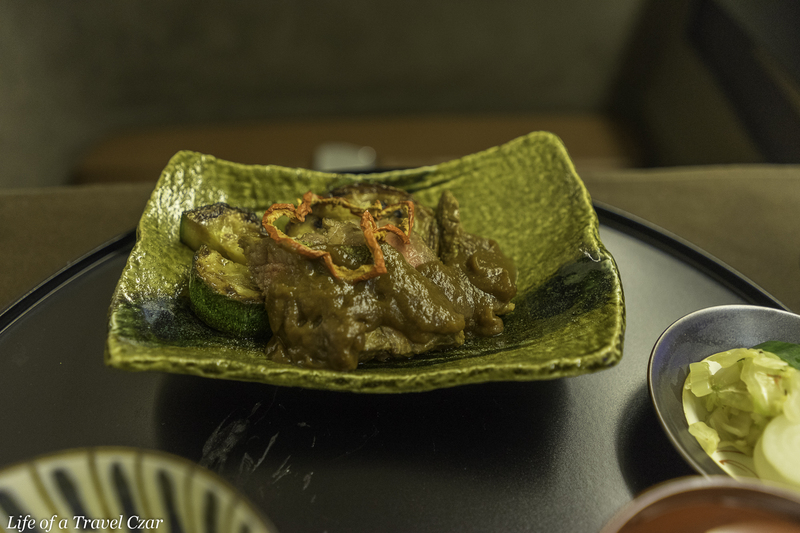 The rich buttery wagyu flavour is a treat, while the sweet soy is classic intertwine of subtle sweet and salinity with the beef’s natural flavour. It is a dream and the rich full bodied Bordeaux with its wonderful tannins works well to partner with the dish. The miso soup is quite standard and I do use the pickles to cleanse the palate before sipping on some Salon in tandem. I do avoid the rice not due to its taste but more to ensure I’m not filled up. The view as the sun escapes the horizon and night sets in, the cabin lighting takes precedence creating a lovely reflection on the brown leather and wooden finishes in the cabin for this beautiful view. I had provided a background on this tea in one of prior posts. Here it is for ease of reference. This is lovely for the dessert, even if I feel kinda sad to abandon the Salon for another drink. The tea is sweet, smoky with some lovely light fruity and herbal hints for a stylish and smooth way to close out the evening. A selection of Japanese sweets are brought out. There is a Jelly drenched in syrup, red bean and a hard candy like sweet (it may have been a exotic dried fruit). I wasn’t that fond of the desserts so I stayed with the wine and tea and just had some nibbles of them. 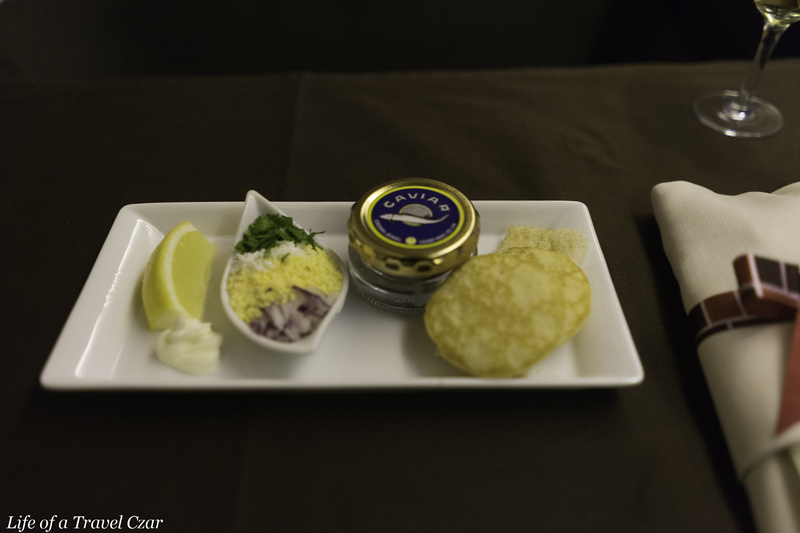 Having finished with the Japanese Menu, I remembered the Western Menu had a caviar course as an option. 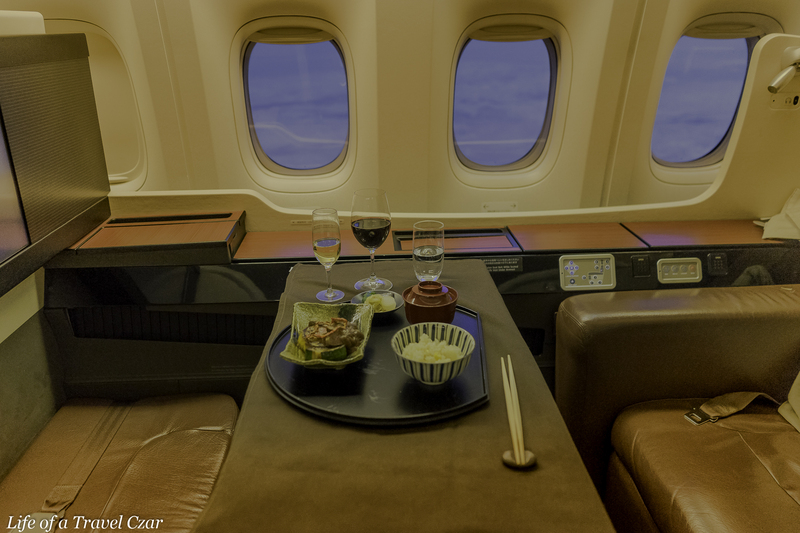 I politely ask the JAL staff if I could have the caviar course as well. They enthusiastically agree and bring out the caviar. The caviar is lovely; it’s rich, minerally and with a refreshing touch of salinity. It leaves a distinct impression on the palate. 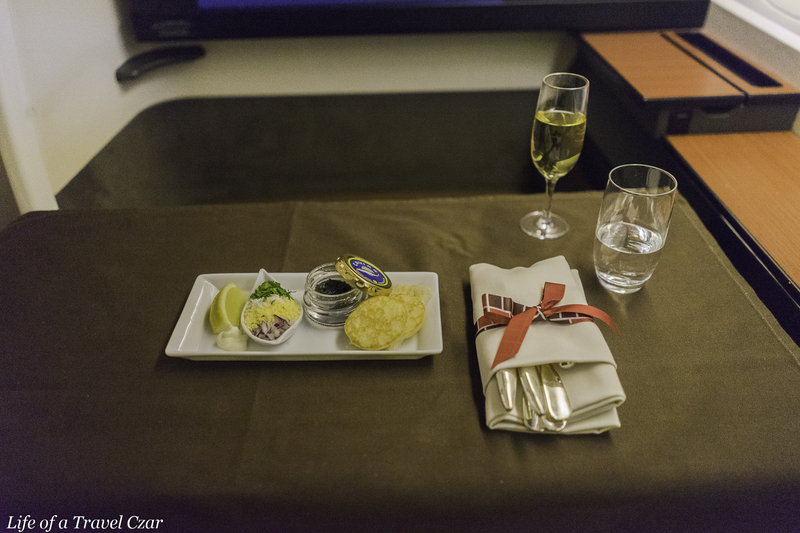 The blinis are sweet and plush and forms the perfect base for the caviar. 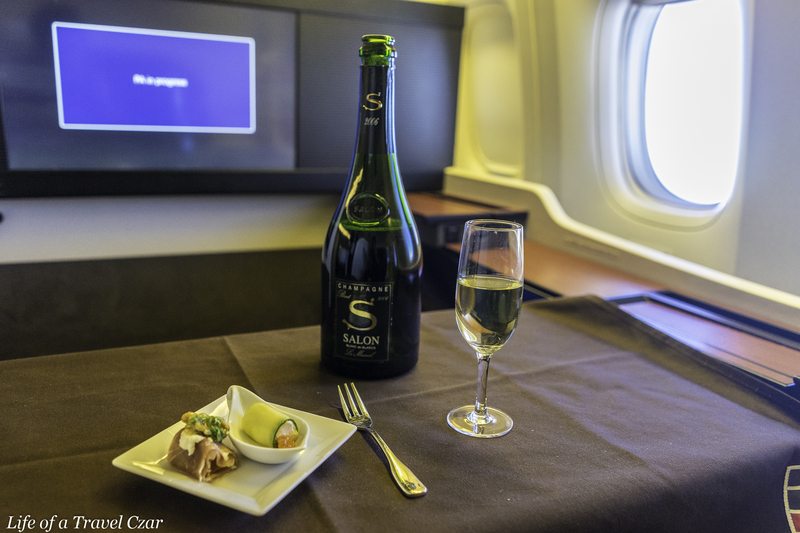 The accompaniments add a lovely touch, but the most fascinating element of the experience is the Salon – the finest champagne in the world paired with the caviar is a moment to behold. The pure sensation of fresh minerality and tart citrus mingled with salinity and richness. 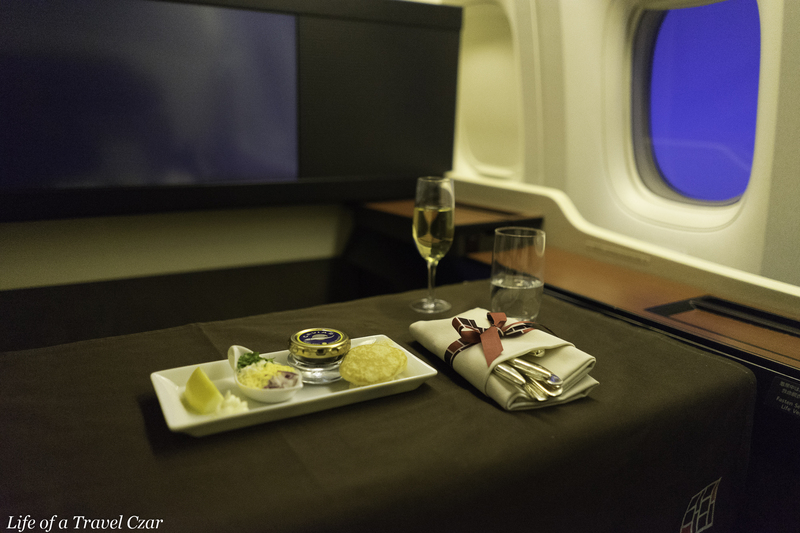 In general amenity kits have been on the decline across all airline’s First Class offerings. 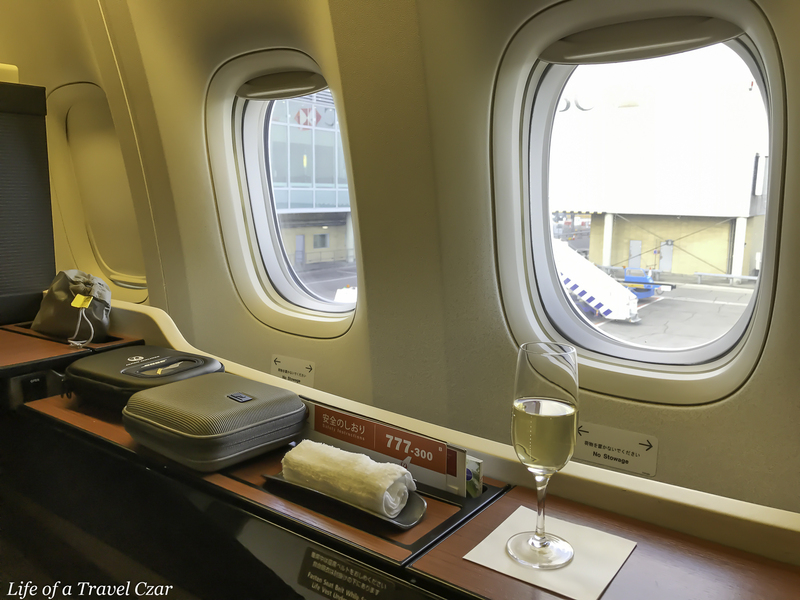 Some don’t offer them on daytime flights, others have downgraded their offering significantly from five years ago and in some cases you’re better off packing your own kit. JAL, however, is the exception. 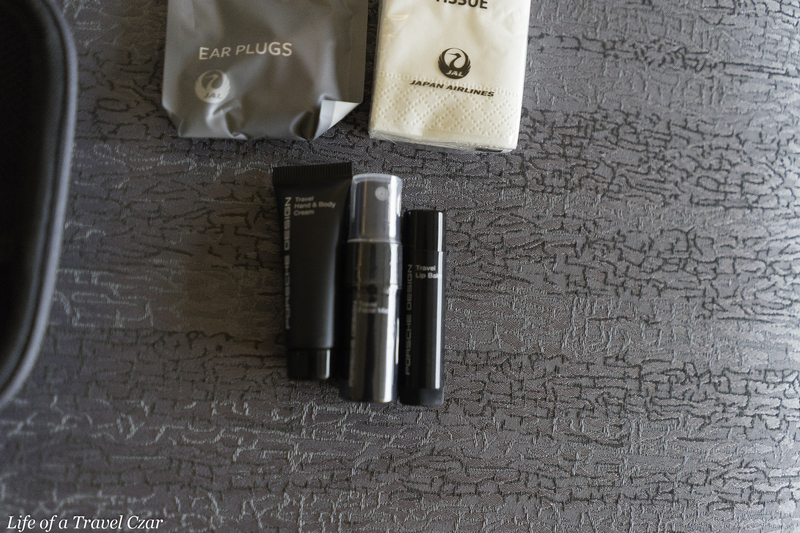 They offer two First Class amenity kits. 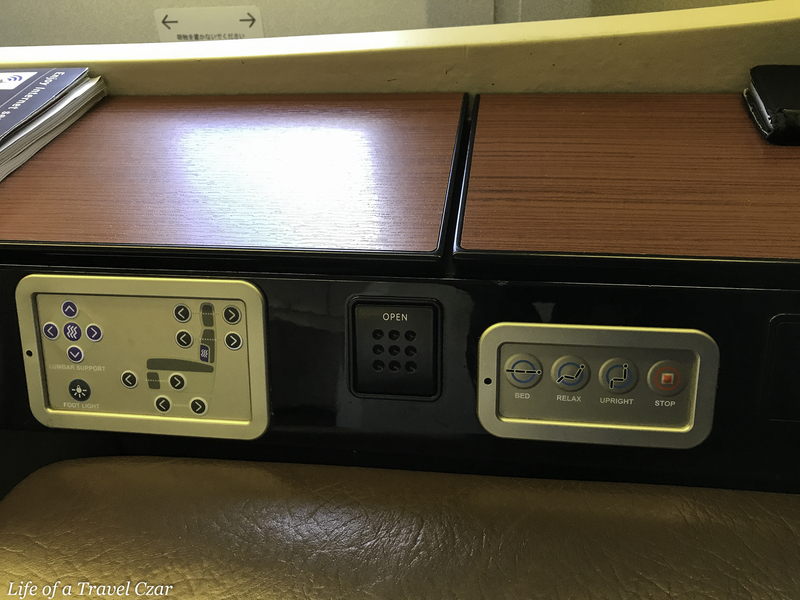 I have the option of a traditional JAL amenity kit or a special Porsche designed edition. Of course, I choose the Porsche edition (who wouldn’t) and for the second amenity kit I am provided with a special kit from Shiseido. 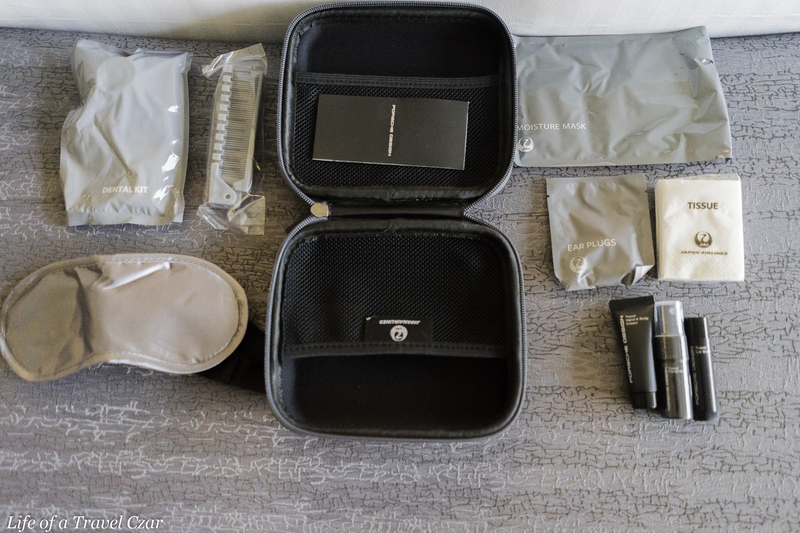 The Porsche kit has a lip balm, creams, moisture mask, eye shades, tissues, comb, moisture mask and dental kit – it is a very comprehensive amenity kit. 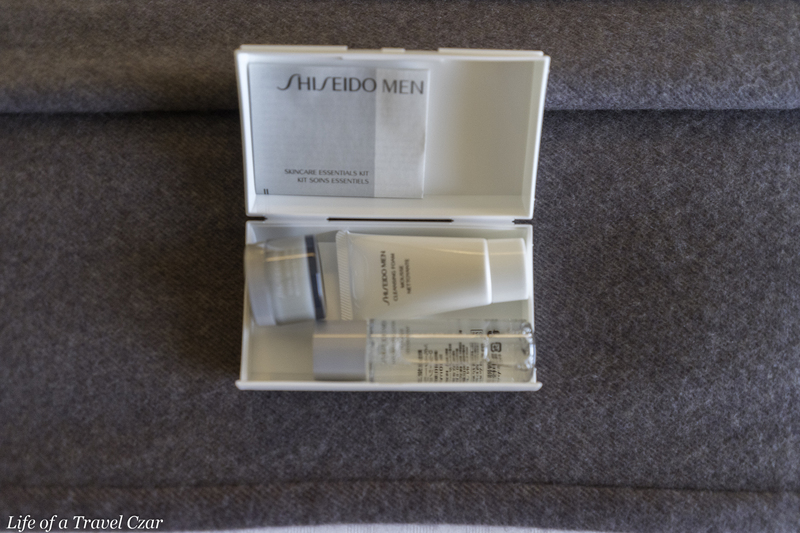 The Shiseido kit has hydrating lotion, total revitalizer and cleansing foam. For the pyjamas, I also have a choice of the traditional JAL pyjamas or the Porsche designed ones. I go for the Porsche ones and they are amazing!! They are a beautiful black colour with grey rim and a wonderful collar with the Porsche design logos on them. I am quite tired and am keen for some rest. 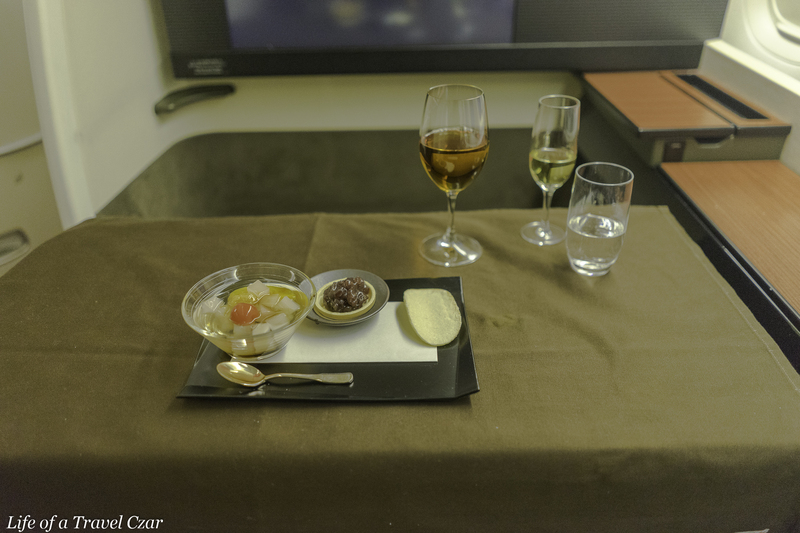 As the cabin is not full (like my previous flight with JAL), the lovely staff make-up the bed in the Suite next to mine so I could continue enjoying the dinner service and IFE. JAL use the Airweave DUAL MODE bedding with one side being firm and the reverse side being soft to cater for different sleep preferences. I do enjoy the sleep onboard as the plane continues to make its way to Japan. Eventually, the sunlight pierces the cabin and I awake as we near Japan. 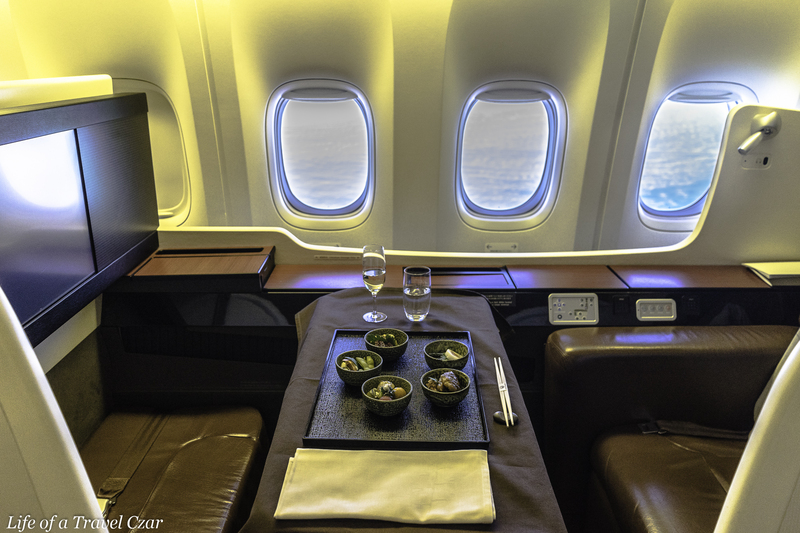 I move back to my Suite and the lunch service is about to commence prior to landing. I resume with the Salon of course…. I love this dish. It’s like the trademark Nobu cod; rich fatty “fall-apart” fish with a sweet subtle miso dressing with the salt of the fish providing a ying yang style taste experience. 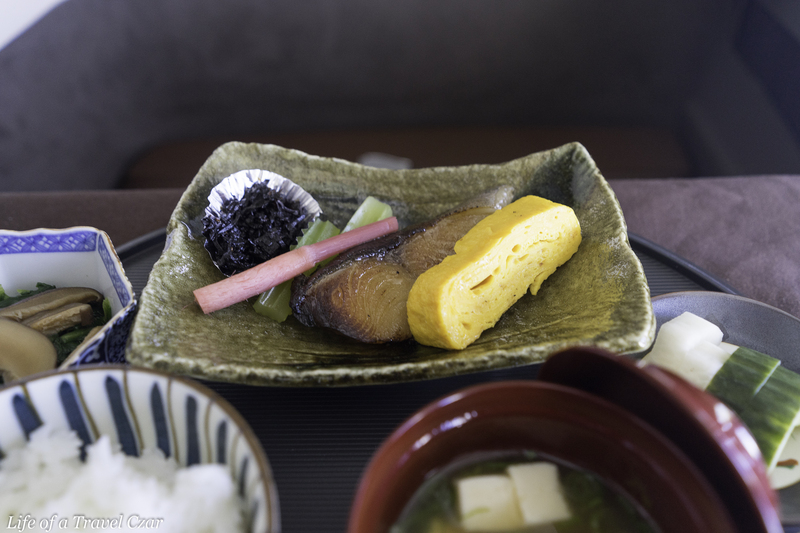 The sea kelp is salty but flows nicely on the tongue and the egg cake offers a nice neutral flavour to balance the stronger elements of the plate. The miso soup is standard and I avoid the rice and picked veggies to keep some space for the next dish. 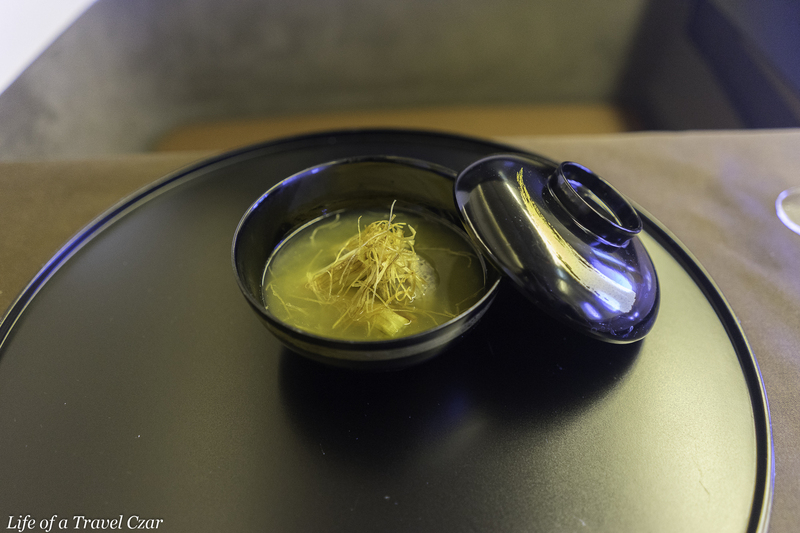 I have a lighter dish to end the flight. 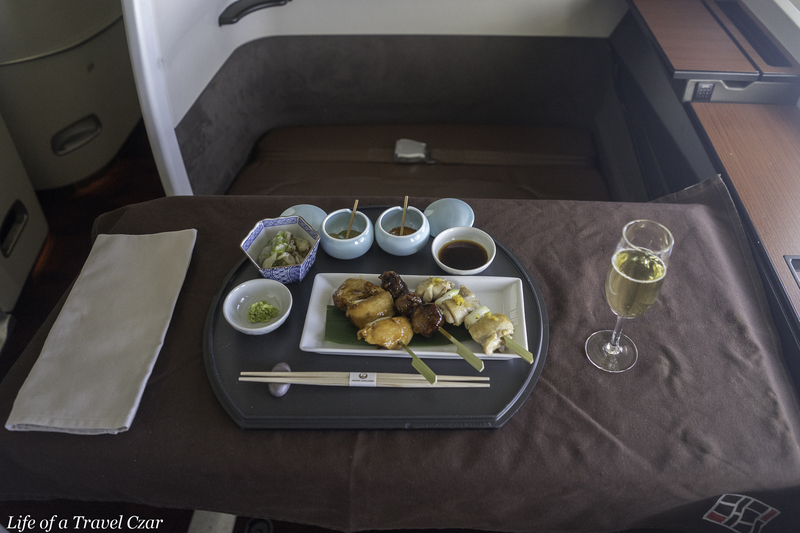 A selection of three delicious yakitori skewers paired with my favourite champagne of course. Pretty soon the pilot informs us of our descent into Haneda airport. The cloud cover was quite heavy but I managed to spot another plane flying beside us as we landed in Haneda. It was a beautiful view of a parallel landing. Hope you enjoy the video. The background tune is “Sundream” by RUFUS. I do not own any rights to the song. 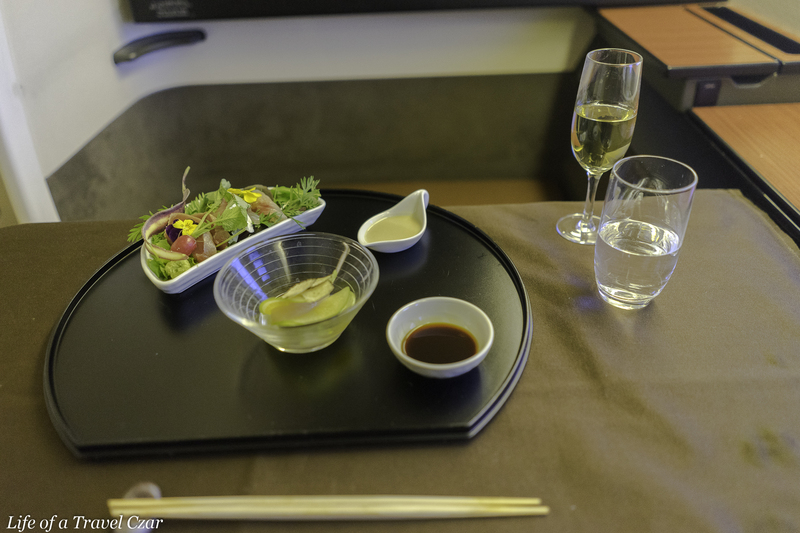 JAL would have to be one of my favourite First Class products. 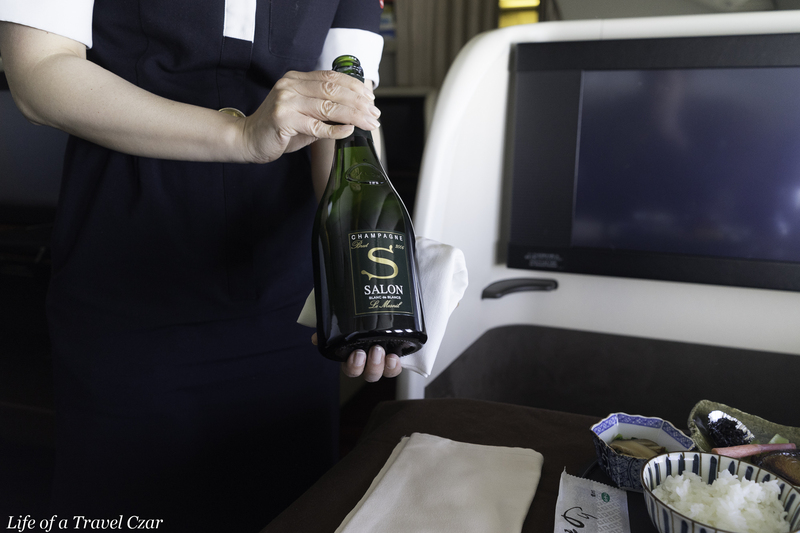 There are two areas where JAL are well ahead of the competition; the standard of the champagne (Salon) is well above any other offering in the market. 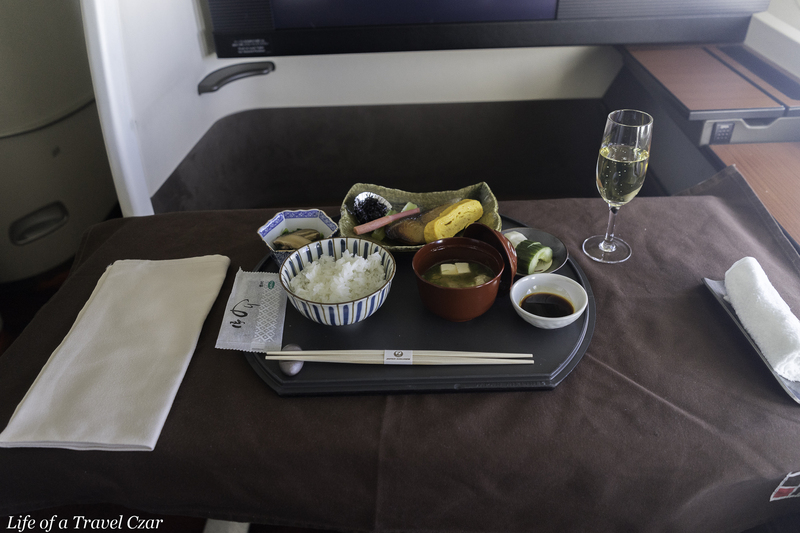 The second is the amenity kit & pyjamas; with most airlines pulling back in this area JAL are well ahead of the pack with their Porsche collaboration and the comprehensive nature of their amenity kit. The Suite is private, the bedding comfortable. 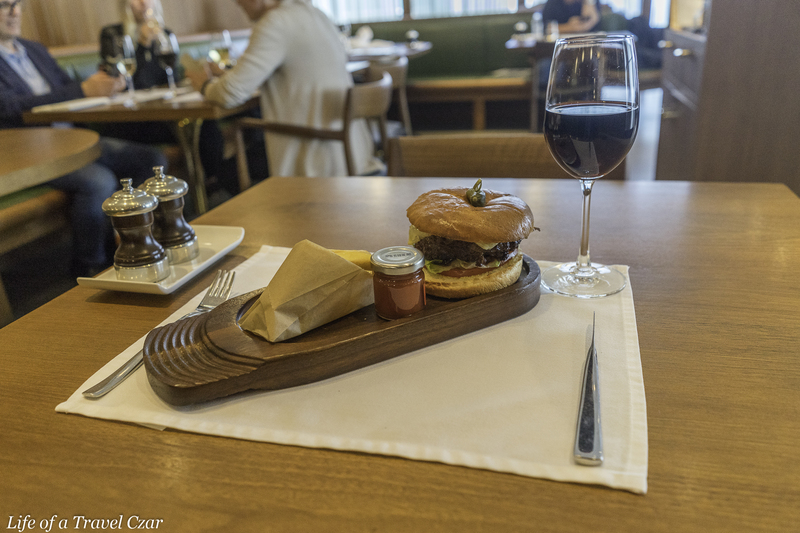 From an aesthetics perspective I do prefer Qatar’s design & ambiance which is a little more luxe compared to the brown leather / wooden finishes. The service is perfect with a focus on extreme politeness and accommodating in every way. 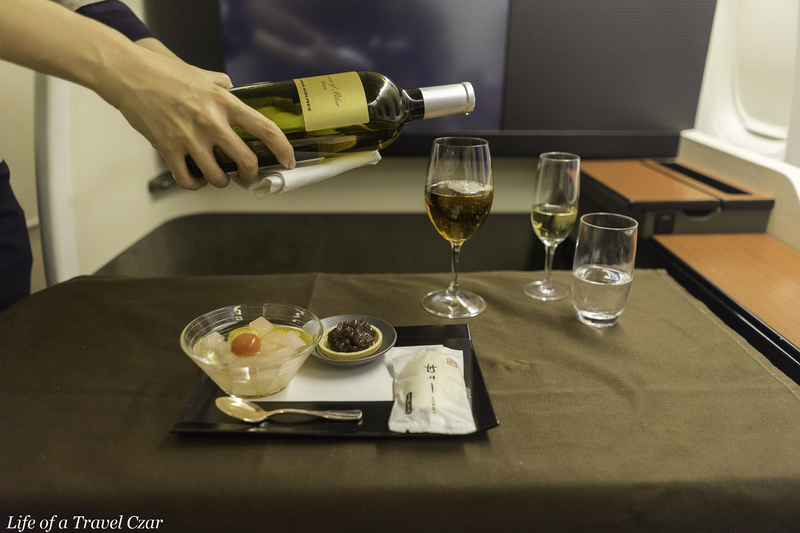 It’s very similar to Cathay’s approach and quite different to Qantas, Qatar & British Airways. 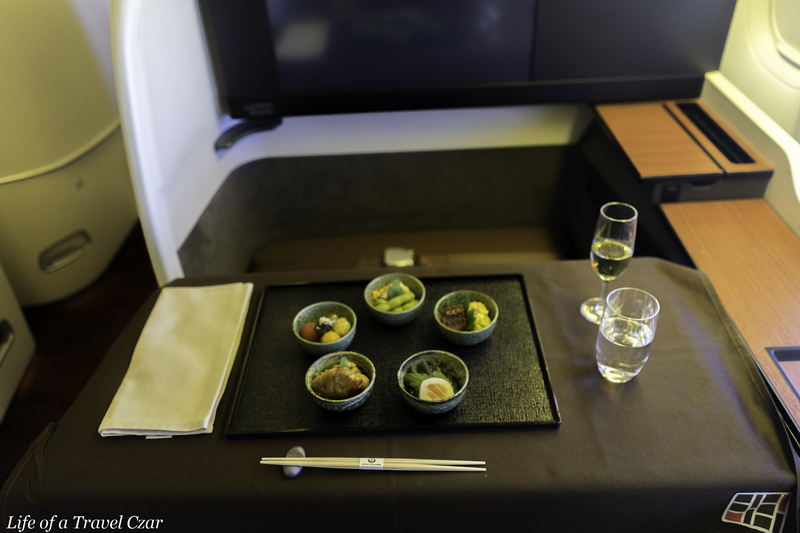 The standard of the catering and the breadth of the food & beverage offering is amazing and in line with other premium offerings; I do enjoy the catering on Qantas, Cathay, BA & Qatar. They seem to all have similar standards in this area. 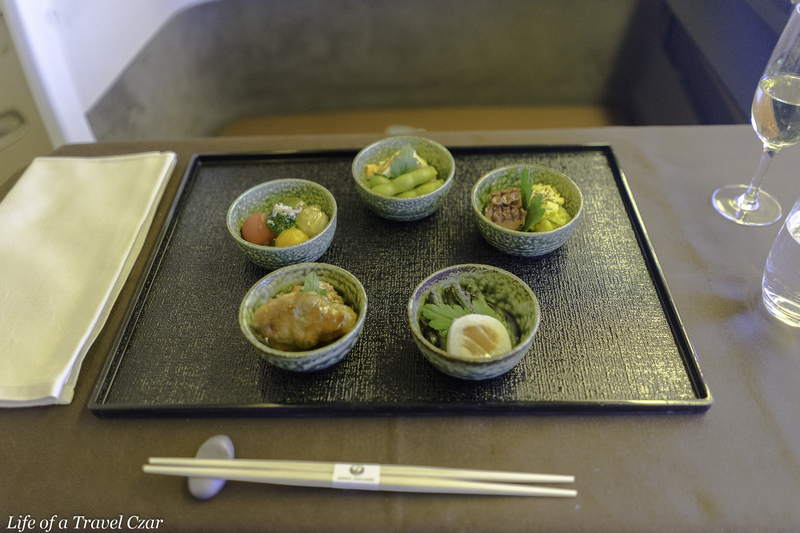 Having said that, I do love JAL’s Japanese tasting menu. 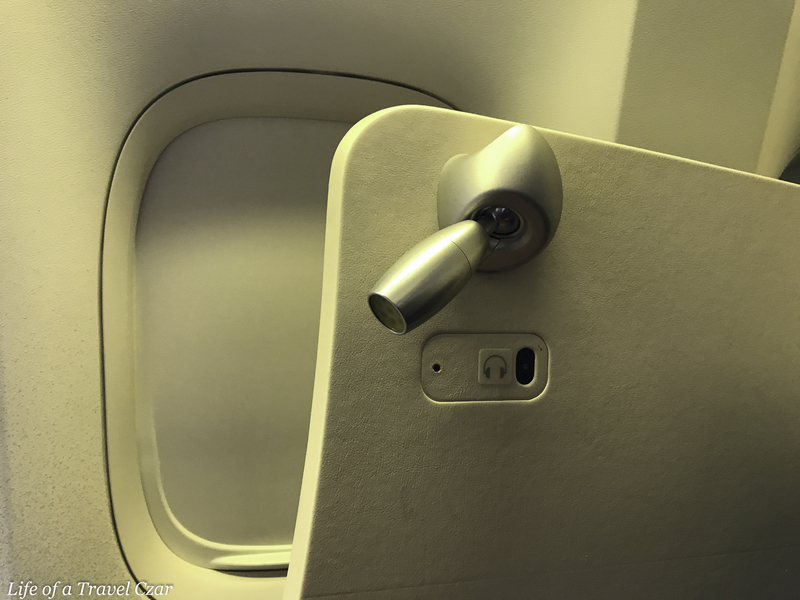 A very enjoyable flight indeed!